The 2011 Dance Company of Middlebury presents “Culture, Cash, and Community: To Have or Have Not,” on January 21 and 22 at the Mahaney Center for the Arts. The Company will then head out on tour to New Orleans. Curtis Institute of Music graduate Nathan Laube rings in the 40th anniversary of Mead Chapel’s magnificent Gress-Miles Organ. Concertgoers can also enjoy a behind-the-scenes organ tour led by Emory Fanning. From Ireland’s national theatre comes an original, gripping drama from playwright and director Mark O’Rowe. In Terminus, a young woman looking for love, a mother seeking atonement, and a serial killer are all ripped from their daily lives and thrown into a fantastical world. 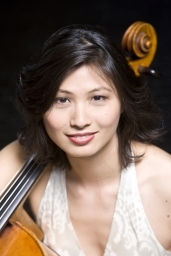 Acclaimed young cellist Sophie Shao returns to Middlebury with violinist Carmit Zori and pianist Shai Wosner to perform a vivid piano trio program featuring works by Schubert, Ravel, and Brahms. In reaction to dance competition reality shows that evaluate who is qualified to dance, Big Action Performance Ensemble (Big APE) presents Everyone Can Dance, a community-based performance project celebrating the contagious allure of movement and the dynamic capabilities of the human body, March 18 and 19. A group of 40 students and faculty from Middlebury's Theatre Program recently spent a Saturday in New York City to see two amazing productions: "The Diary of a Madman," starring Geoffrey Rush, and "Beautiful Burnout," by Frantic Assembly/The National Theatre of Scotland. Award-winning playwright Sarah Ruhl's dreamlike retelling of the Orpheus myth asks: what would any of us do with a second chance? Directed by Alex Draper '88, with actors Gillian Durkee ’12, Willy McKay ’11, Dustin Schwartz ’11, and others. In conjunction with the Department of Theatre and Dance's upcoming production of Hecuba, the Department of Classics hosts a symposium October 29–30 centering on Euripides' gripping tragedy. With performances that convey “heroic power and Olympian vision” (Los Angeles Times), as well as “splendor, drama, passion, poetry, and subtlety” (Boston Globe), this encore artist on the Middlebury College Performing Arts Series will perform works by Beethoven and Chopin. Having gained an enviable reputation as one of the leading quartets of the new generation, this acclaimed chamber music ensemble performs a repertoire that plays to its strengths: Beethoven’s String Quartet No. 15 in A minor, Op. 132, andSchubert’s String Quartet No. 15 in G Major. Adapted and directed by Jay Dunn ’00, this new production of Molière’s last work is an exploration of the French dramatist’s final hours, re-envisioned for the modern stage with a nod to the ensemble theatre work of Jacques LeCoq. Howard Barker's hard-hitting drama recounts the politics and history of 16th century Britain through a distinctly contemporary lens. The Middlebury production will explore issues of violence, sexuality, and power with the energy of a punk rock show. An audience favorite and a frequent guest on the Middlebury College Performing Arts Series, Paul Lewis plays the second in a series of five Schubert concert programs: 12 Waltzes, Four Impromptus, Hungarian Melody in B Minor, and Sonata No. 18 in G Major. British pianist Paul Lewis is internationally recognized as one of the leading pianists of his generation. This concert is the third in a series of five concerts in his worldwide Schubert project, performing all of the composer's mature piano works from the Wandererfantasie onwards. The Middlebury College Department of Theatre and Dance presents Serious Money, a play by Caryl Churchill, and directed by Cheryl Faraone, May 3-5. Set in the trading pits and board rooms of London’s financial district, known simply as “the City,” the play explores themes of greed, power, and politics. Get ready for unique sights and sounds as double physics/music major Hannah Waite '11 performs original music and speaks about the unusual instrument she designed and built herself. The Middlebury College Department of Music presents The Sound Investment Jazz Ensemble on Saturday, May 5, 2012 at the Mahaney Center for the Arts, fresh on the heels of the ensemble’s spring tour. At ceremonies at the Kennedy Center on April 23, senior Carlie Crawford won the Barbizon Award for Excellence in Costume Design, and sophomore Daniel Sauermilch won the John Cauble Award for Outstanding Short Play. The first of its kind, this community-wide Festival will further the appreciation of the music, life and work of Johann Sebastian Bach by providing College and community audiences with three days of performances and interest sessions May 6-8, 2011. The beautiful sounds of ringing bells will fill the air again this summer, as the 26th annual Middlebury College Carillon Series treats audiences to free performances on Friday evenings at 7:00 P.M. in and around Mead Memorial Chapel. Hans Hielscher, the brilliant carillonneur and organist from Wiesbaden, Germany, pays a midsummer visit to Middlebury College to perform in two concerts at Mead Memorial Chapel: a carillon concert on Friday, July 29 at 7:00 PM (the “peals”), and an organ recital on Saturday, July 30 at 7:30 PM (the “pipes”). From composer Su Lian Tan and librettist Anne Babson comes this bold new experiment in opera, featuring an accomplished international group of artistic collaborators: Brenda Patterson, soprano; Miriam Gordon Stewart, soprano; Meridian Arts Ensemble; video set designer Tim Bartlett ’98, and a host of others. Middlebury and Amherst College jazz groups make music together on October 10 at the Mahaney Center for the Arts. The concert echoes a landmark collaboration between jazz greats Count Basie and Duke Ellington, 50 years ago. On April 22, the MCO gives a free public performance including two world premieres by Middlebury College seniors: Piano Concerto No. 1 by Nicholas Tkach ’11, and Requiem for Choir and Orchestra by Noah Silverstein ’11. The College community bids farewell to the wooden sculpture "So Inclined" with a public lecture by artist Patrick Dougherty on October 28. The enchanting, community-created, sculptural project has stood outside the Mahaney Center for the Arts for the past four years. Dougherty will discuss his world-wide projects and commissions since that time. Big Love, an emotionally extravagant comedy by OBIE Award-winning playwright Charles Mee, opens the 2011-2012 theatre season with performances October 27-29 at Wright Theatre. Loosely inspired by Aeschylus’ The Suppliants, Big Love takes us on a whimsical journey from Greece to Italy, when 50 Greek brides are betrothed against their will to their American cousins. The Middlebury College Performing Arts Series presents this acclaimed Viennese string quartet in a concert of Mozart, Webern and Schubert. The concert is presented free and open to the public, thanks to the generous support of the Institute for Clinical Science and Art. An eclectic group of some of Vermont’s finest performers will take to the Concert Hall stage at Middlebury College’s Mahaney Center for the Arts for a collaborative performance on Saturday, November 5, 2011 at 8:00 PM. Russian piano sensation Alexander Melnikov makes his Middlebury College Performing Arts Series solo debut with a program of Shostakovich’s 24 Preludes and Fugues, op. 87, a tour de force set of works in every major and minor key. Middlebury College senior Jeremy Cline ’11.5 presents his thesis dance work November 18-19. A joint major in dance and religion, Cline focuses his work on elements of ritual performance and investigates the nature of our relationships with spirit. The Middlebury College Department of Theatre and Dance present a play by Nick Dear, directed by Richard Romagnoli. Based on the life of 18th century painter and engraver William Hogarth, this bawdy comedy uncovers the dark underbelly of 1700s London. Dutch mezzo-soprano Christianne Stotijn and the world’s most in-demand collaborative pianist, Julius Drake, will perform together at the Mahaney Center for the Arts on December 2. Their concert program will include songs by Schumann, Mahler, and Eisler. Middlebury College students will explore the musics of Uganda in a free public concert on December 6. Directed by Dr. Damascus Kafumbe, the ensemble will present an hour-long program of instrumental, song, and dance. The community is invited to ring in the holidays at Mead Chapel on December 11, with the 40th annual service of Lessons and Carols for Advent and Christmas. The popular event includes Bible readings and carols for choir, organ, and congregation, modeled after the long-standing British tradition. This sensationally gifted musician returns to Middlebury after a 2-year wait to perform works by Bach, Mozart, Liszt, as well as Rachmaninoff’s first piano sonata.